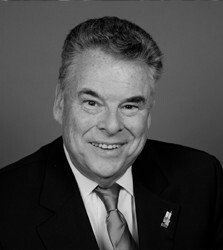 Congressman Peter T. King is a Republican Congressman from Long Island, New York and represents New York’s 2nd Congressional districe. King has been in Congress for nearly 26 years and is serving his 13th term in the 114th Congress. He announced his interest to run for president in an interview with CNN’s Wolf Blitzer in 20141. King has established himself as one of the leading voices regarding the War on Terror and foreign affairs in general. He has been a consistent voice in favor of the invasion of Iraq and aggressive measures to combat terrorism. He is likely to gain the respect of defense hawks and potentially their support in a nomination battle. As might be expected of a Republican representing Long Island, King is not going to be mistaken for a Tea Party ally anytime soon. He has publicly criticized the Tea Party and some of it leading voices, including Ted Cruz and Rand Paul. His record on spending is out of step with most conservatives, and he has been a reliable ally for the interests of organized labor. King’s record on other issues is much more in sync with limited-government views, however. He voted against Obamacare and has supported numerous free-market health care policies including health savings accounts, and he has opposed cap-and-trade and other regulations that would hinder economic growth. He favors construction of the Keystone XL pipeline. His fundraising has been adequate for a sitting member of Congress but it would likely be a challenge for him to gear up to raise the sort of money needed to run a national campaign, although he is from New York which may offer him a boost in fundraising. King would be considered a longshot for the Republican nomination in 2016, as aside from defense and anti-terror hawks it’s difficult to see where his support might come from. The free-market and libertarian wings of the Republican party will find little to like, and nearly every other candidate is as appealing if not more appealing to social conservatives. But the same could have been said of John McCain in 2008. King was born in Manhattan in 1944 and raised in the Manhattan borough of Queens. He is a graduate of St. Francis College in Brooklyn and the University of Notre Dame Law School2. After graduating law school, King worked in private practice as the deputy attorney for Nassau County, New York and served in the New York National Guard from 1968 to 1973.3 King first ran for office in 1977 – winning a seat on the Hempstead, NY City Council. He then won election as Nassau County’s comptroller and served in that role until 1993. He was the Republican nominee for Attorney General in 1986. In 1992 King ran for an open seat for Congress and won, eking out a 3 percent win despite being overwhelmingly outspent. In later years he faced a series of either token or self-funded opponents, but routinely won re-election without much difficulty. Congressman King and his wife, Rosemary, live in Seaford, New York and have two adult children and two grandchildren. He is a Roman Catholic and is a member of the Knights of Columbus, Knights of Phythias, AMVETs and the Fighting 69th Veterans Corps4. As of 2012, King has an estimated net worth of $325,0005. The name “Pete King” and the word “renegade” have been considered synonymous6. Congressman King has been known to buck some of the constituencies within the Republican Party, particularly with Tea Party leaders Senator Ted Cruz (R-TX) and Senator Rand Paul (R-KY). His primary reason for a potential run in the 2016 Republican primary would be to challenge these two Senators, also referred to as the Tea Party Candidates. In an interview with Wolf Blitzer, Congressman King said, “I’m looking to do this because I see people like Rand Paul and Ted Cruz and, to me, I don’t want the Republican Party going in that direction8.” He was a very public critic and went so far as to tell Senator Cruz and his like-minded colleagues to “keep quiet9” when they began to meddle in lower Chamber’s affairs regarding the potential shutdown of the federal government in 2013. King was one of the few Republicans to vote against the Senate Republicans’ plan to attach the defunding of Obamacare to the Continuing Resolution that was needed in order to avoid a federal government shut down in 201310. The plan failed and the government shut down from October 1 – 16, 201311. King has ties with the Irish Republican Army (IRA) dating back to the 1970s. The IRA is a violent terrorist group based in Europe whose mission has been to secure the independence of Northern Ireland from Great Britain. King was banned from the British Broadcasting Corporation (BBC) for his pro-IRA views and for his failure to denounce IRA actions that resulted in the deaths of nine Northern Irish police officers, killed by one of their mortar bombs. However, since the September 11, 2001 attacks, King has distanced himself and his support for the IRA – namely for the increasing anti-American sentiment in Ireland following the invasions of Afghanistan and Iraq and the increased “criminality” of their actions. The Congressman from New York’s 2nd District received considerable criticism for his effort to hold congressional hearings on the potential radicalization of Muslim Americans and it was considered by some to be a witch-hunt12. King gets more than his fair share of national press – from the government shut down of 2013, when he was sharply critical of Ted Cruz, to the controversy over his call for hearings on the radicalization of American Muslims. Even though some of his recent actions like the fiscal cliff debate may give fiscal conservatives heartburn, he has been supportive of other tax-friendly proposals in the past. For instance, he has voted in favor of a constitutional amendment requiring a two-thirds majority to raise taxes,26 repeal of the medical device tax,27 the repeal of the marriage penalty,28 in favor of an income tax deduction for small businesses,29 in favor of extending the Bush tax cuts,30 and in favor of repealing the 3.8% capital gains surtax for Medicare31 imposed by Obamacare. King has resisted the push for the federal regulation of fracking and instead has supported keeping the authority to regulate at the state and local level.37 He is a supporter of lifting the ban on offshore drilling38 and building the Keystone Pipeline,39 and has voted against legislation that put further restrictions on gas and oil drilling.40 He has supported placing restrictions on the designation of “critical habitats” for endangered species41 thus protecting private property and economic development. King supported the Wall Street bailout in 2008. As a Congressman, King has not had the opportunity to vote on any president’s judicial nominations. In 2014, Congressman King praised the Hobby Lobby decision91 exempting employers from being forced to supply birth control as part of their health benefits to employees if that provision violates their religious beliefs. King voted in favor of protecting news reporters and restricting government access to a reporter’s files,92 thereby protecting their 1st Amendment rights. He also voted in favor of restricting the activities of independent grassroots organizations organized under IRS code 52793. The organizations, known as “527s,” are independent organizations formed to function independently from a candidate’s campaign committee but actively support or oppose a certain candidate. In 2013, King introduced an amendment that would override state laws on food safety,94 something likely to be viewed with mixed feelings by conservatives. The amendment would have pre-empted onerous and costly regulations on many products being imposed or considered in states, but also runs contrary to the idea of federalism and the 10th Amendment. King has supported the expansion of charter schools and expanding school choice.95,96 He followed Republican Party leadership when he voted in favor of President George W. Bush’s “No Child Left Behind Act” in 200197 although some in the Party did not support the measure because it increased the federal government’s role in education – something many conservatives oppose. In the case of Congressman Pete King, some of his greatest strengths could turn out to be some of his greatest liabilities. His independent, outspoken personality certainly wins him the attention of the cameras but could alienate those key constituencies needed to win the Republican nomination, particularly in the Tea Party and limited-government movements. King also has an issue with his past support of the Irish Republican Army (IRA), one of Europe’s most violent terrorist groups. While he has distanced himself from the group and its mission since 9/11, it is a relationship that existed for nearly 30 years prior. Further, his call to hold hearings on the radicalization of Muslims in America is also a big vulnerability and has received widespread criticism, particularly on the hypocritical nature of this call given his past relationship with the IRA. If King decides to make a serious run for the Republican nomination, he will also need to diversify and expand his fundraising reach and take it to a national level. His PACs have raised less than $60,000 and he will be up against potential candidates who have signfiicant fundraising abilities.